Ornamental fencing, in a variety of styles including traditional, contemporary or southwestern, can add elegance and sophistication and elegance to your landscape. 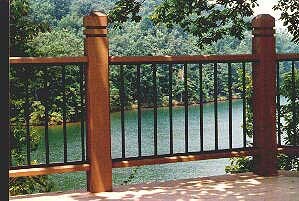 Combine picket spacing, style, height and material components to provide the level of security you desire while still maintaining a pleasing and attractive view. We use only the toughest, most durable materials available to the fencing industry to achieve the results you want. Competitive prices, superior service, total reliability and years of experience unsurpassed in the industry ensure we give your project the attention it deserves. Quality craftsmanship and an artistic flair, combined with attention to detail ensure our work is of the finest quality. Call today to consult one of our experienced project managers, who can turn your dream into a living reality. Alternatively you may request a quote by email. 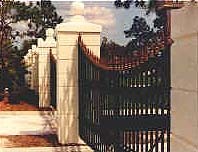 If you wish to see more, view our galleries to browse some of the finest ornamental fencing projects in Florida, plus our sturdy railings, decks, and entry gate systems.